Are load bearing walls bolted down? 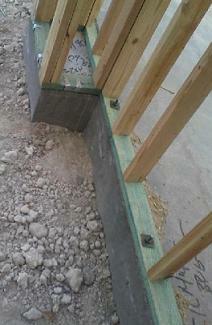 Are load bearing walls required to be bolted down to the foundation wall or concrete slab? Not necessarily but it depends on the location of the wall. If the wall is at the interior which means if it is not at the perimeter of the house, it less likely a shear wall therefore not required to be bolted to the slab or foundation. 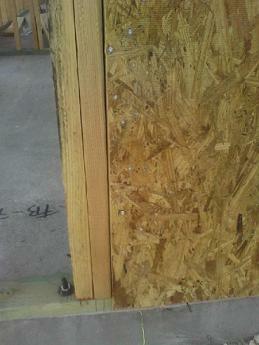 Even though it's not required to be bolted, it required to be nailed to the slab with concrete or masonry nails. In the event something leans against the wall, you don't want it moved. If the wall is located the perimeter of the structure, it is highly likely part of the lateral resistant shear wall of the structure and therefore required to be bolted to the foundation or slab. The photo above is a wall at the perimeter of the structure and is a bearing wall that carry both floor truss and roof truss. Since its at the perimeter it is also a shear wall which require to be bolted. Other time where bolted wall is required is if you have a stub wall only a few feet above the floor that is cantilevered from the slab. In such case it requires to be bolted for strength.